On our regular meeting we will have Melani Brewer Trunk Show: "Evolution of an Art Quilter"
Melani is a Florida Fiber Artist that some of us already know from her work in SAQA exhibits and in our own Quilt South Florida. In this presentation Melani will explain how she evolved from a traditional quilter to an art quilter. She will explain some of the steps she took to get to where she is today. The presentation will include many quilts that she made along the way. 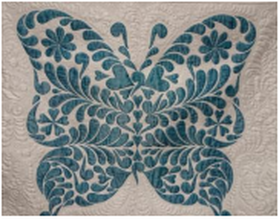 she began quilting in 1979 as a very traditional quilter. Finding this restrictive to her creative ideas she began experimenting with different techniques. It will also be a busy month for us. First we will have the Veterans Ceremony - Quilts of Valor, followed by a Saturday class. Saturday class we will be a 1/2 day class, and Sunday a full day class. Both with Marina Landi a Fiber Artist from Brazil, that that some of us already know from her work in U.S. Quilt Shows, She is a SAQA Brazil member and had many quilts in the Shows I have curated in Brazil and here in U.S.
We think about Marina also when we remember her work from the Houston International Quilt Festival. Who could forget her beautiful quilts that received the big prizes in 2014 and last year? Our Holliday Party - A joyous time to come together and share the holiday spirit.